WHEAT being harvested in Central Queensland is being snapped up by the region’s lotfeeders amid talk that a vessel will bring feedgrain into Gladstone this summer to help compensate for disappointing yields in the harvest so far. 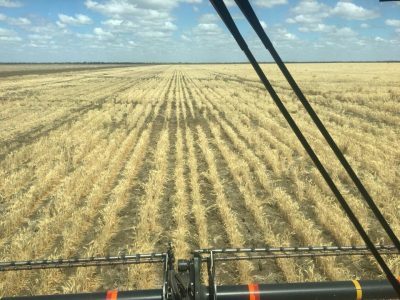 Low yields have been the hallmark of most 2018 wheat crops harvested in Central Queensland to date. Central Queensland’s better crops are largely south of Emerald and in the Dawson-Callide region, where harvest is yet to start, and trade sources say even these are not expected to get CQ’s end users through to new-crop 2019 wheat. “Lotfeeders are paying big money to keep that CQ wheat in CQ, and there’s certainly enough demand up there to take care of a vessel when you add in other users like Ridley in Rockhampton,” one trade source said. The market for wheat of any quality ex-farm CQ is currently around $450 per tonne, compared with $465-468/t on the Darling Downs. “That CQ wheat won’t price into the Downs at that level — it’s too expensive to bring south,” a trader said. Some chickpea crops south of Emerald have been cut for hay, but this has primarily gone to graziers rather than feedlots. CQ wheat harvested so far has in some cases struggled to make 1 tonne per hectare, with reports of 0.5 -0.7t/ha for some crops. The Downs market has continued to source the bulk of its feedgrain supplies from vessels bringing wheat into Brisbane from South Australia and Western Australia, which are also feeding into Newcastle and Port Kembla. Feedlots in southern Queensland and northern New South Wales have been paying up to $500 per tonne for good-quality wheat and barley hay to produce roughage in their rations, but one broker said the market had eased in recent days. “A lot of those crops that have been cut for hay near Goondiwindi might have been hit by frost, which would have affected their yield prospects,” a trader said. One transport operator said feedlots near the Queensland-NSW border were paying a premium to keep hay within the district, and graziers on the northwest slopes of NSW could land hay from Victoria for less than they could from the border regions. Pinnacle Commodities broker Rod Buckle said end-users were continuing to scramble for old-crop stock as worries over new-crop mount. The Darling Downs cottonseed market has been trading at around $650/t, up roughly $20 in the past week or two in response to weakened prospects for winter crops in northern NSW and southern Queensland as they get close to harvest. In parts of southern NSW, Victoria and eastern South Australia, strong hay prices and emerging signs of frost damage have encouraged some growers to cut canola and cereal crops for hay, which is expected to tide its graziers over for the summer months. “Victoria’s falling over by the day,” one trader said. Some good commentary here. The southern NSW and Victorian crops are folding up quicker than most realise and as your writer eluded too the regional consumer is going to fight to own all local production as ultimately this will or maybe the best value product he see’s for the next 12 months.